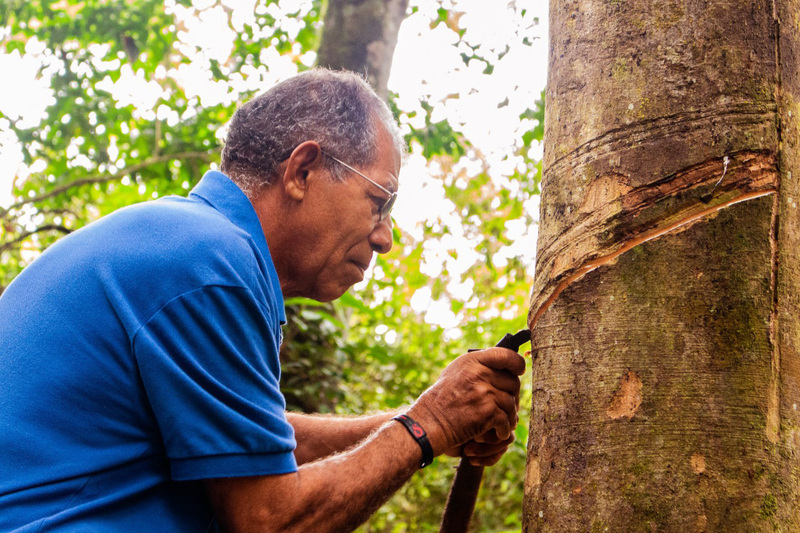 In the image, Getúlio Gabriel is tapping rubber, an activity that he practiced since very young and that he learned with his father, Mestre Gabriel, Seringal Sunta | Picture: Walter Badaró. Getúlio Gabriel da Costa, first-born son of José Gabriel da Costa (Mestre Gabriel) and Raimunda Ferreira da Costa (Mestre Pequenina), was born on September 2nd in 1948. In the seringais (rubber tapping area of the forest), already in childhood, he helped his father in the tapping of the rubber and in the housekeeping, demonstrating responsibility early on, one of the hallmarks of his character. Mestre Gabrel tapped the rubber by day and Getúlio at dawn. He would wake up at one o’clock in the morning and come back at dawn bringing the latex to be smoked. Like this, their productivity was increased. He always helped his father in the spiritual work as well. Inside the União do Vegetal, he has been present since the first harvest of the Mariri and Chacrona made by the Mestre upon his arrival in Acre, as well as the first Preparo of Vegetal. On July 22nd, 1961, the date of the creation of the Beneficent Spiritist Center União do Vegetal, it was Getúlio who led the Preparo, oriented by Mestre Gabriel. Because he would wake up at dawn, he didn’t participate in all the sessions, but he relates the experience of the significant moments of the beginning of the União do Vegetal in the ‘’seringais’’ with emotion and nostalgic joy. Another defining moment of his life was arriving in Porto Velho, on New Year’s Day, on January 1st of 1965. It was the first time he saw fireworks; marking the arrival of the family in a new phase of life. 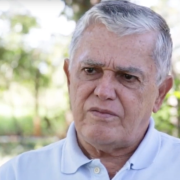 Further ahead, in the fulfillment of his mission, Mestre Gabriel verbally delivered to Getúlio the responsibility for the family, along with the money he had and the key to the truck, before going to Manaus, and then later to Brasília, where the Mestre disincarnated on September 24th of 1971. Getúlio came to be the Representative of his father as the provider of the home and in the raising and orientation of the siblings. He fought alongside his mother, working at the brick factory during the day and as a taxi driver at night. He spent many sleepless nights, but he never let what was necessary at home go unattended. Later, he became an employee of the City Hall of Porto Velho, and in 2007 and 2017 he received two Certificates of Recognition from the City Hall, in homage for his good example as a professional, in recognition of his efficiency, readiness and attendance during all his years. In a recorded testimony, Mestre Pequenina affirms: ‘’Getúlio was a boy who, out of all of my children, never got is attention. We never hit him, not even playing. A boy that never lied to his father, not to me, nor to anyone. His word is as Mestre Gabriel says: ‘If two people come here telling me a story and Getúlio were to tell it, it is proof to me. Because he is a rightful man’. And she continues: ‘He only married after he helped me raise all of his siblings. And I told him to get married: my son, get married’’’. Recently, shortly before she disincarnated, Mestre Pequenina also delivered to him the responsibility of representing her in the home, providing and caring for his brothers Róseo and Benvino, as if they were his own sons. Today, on September 2nd, 2018, Getúlio commemorates 70 years of life, with vigor and a clear and strong memory. A happy, honest and virtuous man. A simple, friendly and obedient disciple with a good heart. To him, our congratulations and wishes for many years of life. *Ricardo Teixeira is a member of the Cadre of Mestres in Núcleo Mestre Iagora (Porto Velho-RO).